The medial plantar nerve is the larger one of the two terminal branches of the tibial nerve, it covers most of the sole of the foot and supplies multiple intrinsic muscles of foot. It arises under the flexor retinaculum and runs forward deep to the abductor hallucis with the medial plantar artery on its medial side. It comes to lie in the interval between the abductor hallucis and the flexor digitorum brevis. 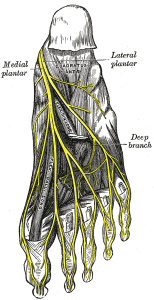 Cutaneous branches: plantar digital nerves run to the sides of the medial three and the medial half of the fourth toe. The nerves extend onto the dorsum and supply the nail beds and the tips of the toes. Muscular branches: it gives a branches to these four muscles, abductor hallucis, flexor digitorum brevis, the flexor hallucis brevis and the first lumbrical muscle. carries sensation from the medial two-thirds of the plantar surface of the foot. 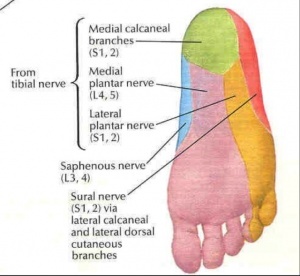 It is a compression of the nerve branches, where the nerve branches are compressed between bones, ligaments and other connective tissues causing a pain at the inner heel area. Entrapment in the medial longitudinal arch of the foot may result in altered sensation on the medial aspect of the sole of the foot. Symptoms include almost constant pain whenever adding a pressure to the foot either by walking or sitting, just standing is often difficult. The condition maybe referred to as Jogger's Foot or Medial Plantar Neuropraxia. Local observation for the sole of the foot is the first step of examination, notice any difference compared with the unaffected side, injury or incision, bruises, lump and the skin colour on the related area. The atrophy muscle is a sign to indicate if there is an impairment of the nerve that innervates the affected muscle, but it is difficult to be recognised with small muscles. You can assess the sensation of the areas supplied by the medial plantar nerve and palpate the related area to check any problems relating to the sensation (either hyper sensitivity or impaired sensation) and/or the tenderness degree. Examine the strength of the muscles that Innervated by the medial plantar nerve, by resisting the movement of the big toe flexion/abduction and toes flexion.